B.S. Preston, Esquire and T. “T.” Logan have had some Excellent and Bogus Adventures. You might know them better from their 1989 film as Bill and Ted. 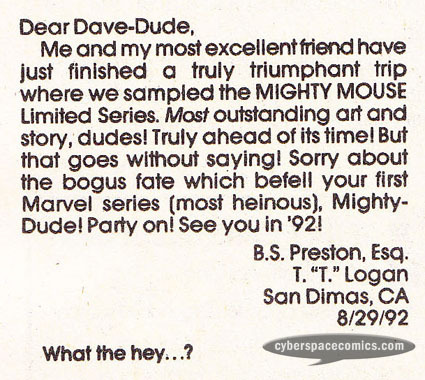 Interestingly enough, as a marketing ploy, they got a letter published in Mighty Mouse#10 (cover date – July 1991). Their series, Bill & Ted’s Excellent Comic Book, debuted in December, later that year. Interestingly enough, rumor has it that the original writer has completed the script to a third Bill and Ted film as of April 2011. Keen observers will notice that our time-traveling pals, Bill and Ted, have dated this letter August of 1992 even though it was published in July of 1991.